If you want to keep track of the visitors to your WordPress blog, how they find your blog, what search keywords that lead to your blog, which posts is more popular and some other blog traffic statistic, then StatTraq is a nice option. 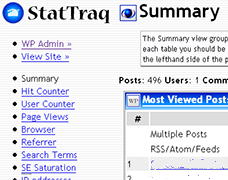 Stat Traq is a WordPress Plugin. So it can only be used with a WordPress blog. It doesn’t support multiple blog too. The plugin maintains a table of usage of the blog. After collecting all the data, the statistic and information can be view via a nice and rich interface. StatTraq can be downloaded from here. StatTraq also has a demo. Note: StatTraq appears to be no longer maintained, developed nor still available for download.